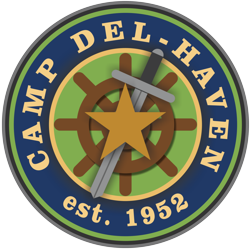 For over 50 years, Camp Del-Haven has had a mission to help kids turn from a lifestyle of crime by offering a summer camp experience focused on the Gospel of the glory of Christ. Currently, most of the children who are invited to the camp come from homes where one or both parents are incarcerated. Del-Haven sends out applications to kids between 6 and 12 throughout Kansas City (and surrounding cities) and offers them a free week of camp. Many children respond to our invitation each year. The staff of Camp Del-Haven is made up of dedicated volunteers who invest their time and talents in this ministry. The camp programming is centered around proclaiming the Gospel to the children who attend. Each morning, camp begins with the staff coming together to pray for the Lord’s leadership in the day’s activities. The campers begin each day with Scripture reading around the flag pole. There are short Bible devotions after every meal and before bed. Two Bible studies a day are also delivered to the children. Each day the children memorize verses of scripture, and on the last night there is a campfire where a message is given and the children have an opportunity to share a testimony of what they have learned during their week of camp. There are other activities at Del-Haven that are included in the programming, such as crafts, swimming, fishing, hiking, sports, and many more outdoor activities. In recent years there has been a focus on follow-up to the children who come to Camp Del-Haven. Part of the current follow-up program includes a monthly newsletter sent to every child. The newsletter includes a message about camp news, a Bible devotion from one of the staff members, and an opportunity to memorize scripture throughout the year. Learning activities and a scripture memory card are included in each newsletter to help the children. It is our hope that this newsletter will be used as a means of getting the Gospel into the homes of these children and help them to develop a practice of memorizing God’s Word. Never before has it been more urgent for the Gospel of our Lord Jesus Christ to be sowed into these young hearts through sound counsel and teaching. This is what Camp Del-Haven is all about. If you or your church would like to recommend a child for our summer camp, volunteer to help, or make a donation to our ministry, please contact us.